Got some good use out of the Dutch Oven & cast skillet. Bacon, eggs, & oatmeal for breakfast. For supper was 7lb pork shoulder cooked low & slow, about 7 hrs. Pulled pork sandwiches. Love the Dutch Oven! Kalamata Olive or Jalapeno Cheddar bread and cheese from a local bakery, sometimes even a scone. Big breakfast once a trip: local bacon (the best ever! ), eggs, home fries with onions. Lots of coffee! Scrambled eggs with cut up cooked breakfast sausage, onion and green pepper. Put in a flour tortilla with shredded cheese and salsa. You can cook the sausage and cut everything up before you leave . Makes a quick breakfast . How do you have that hooked up? Looks like it is on the BBQ hose. A good recipe for breakfast is Sweet Potato and Sausage Hash. You can serve it with eggs if you like. Take the number of needed sweet potatoes and either cube them or grate them. Do the same with one apple. One diced onion. Cut your sausage links into chunks. We like the newer chicken, gouda, and apple sausage that is free of nitrates - there are several different brands available. 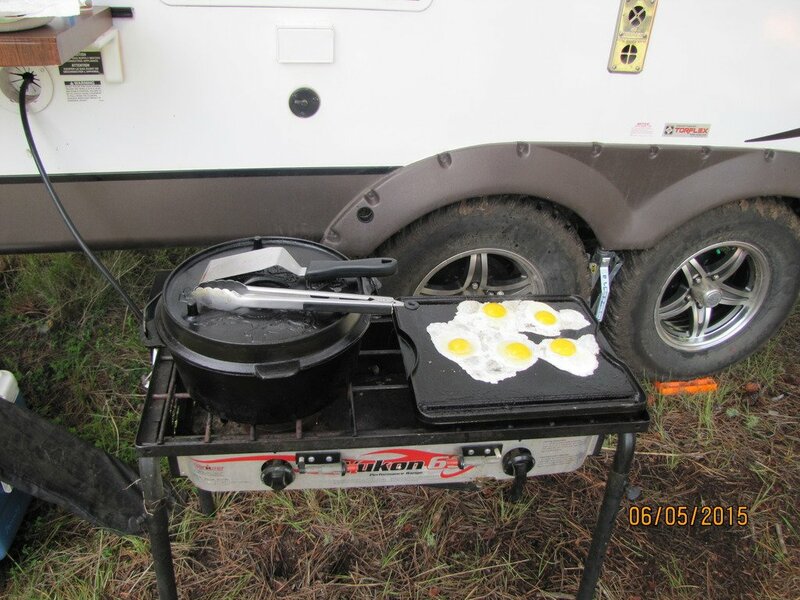 Fry up in a cast iron skillet - either on the gas stove, or we do it on our Big Green Egg. Yummy!! Gator eggs - eggs, green pepper, onion, garlic, cut up sausage, Montrey cheese and 1 tablespoon hot sauce. Cook on cast iron pan. Mountain Man Breakfast, will use this again & again - simple. 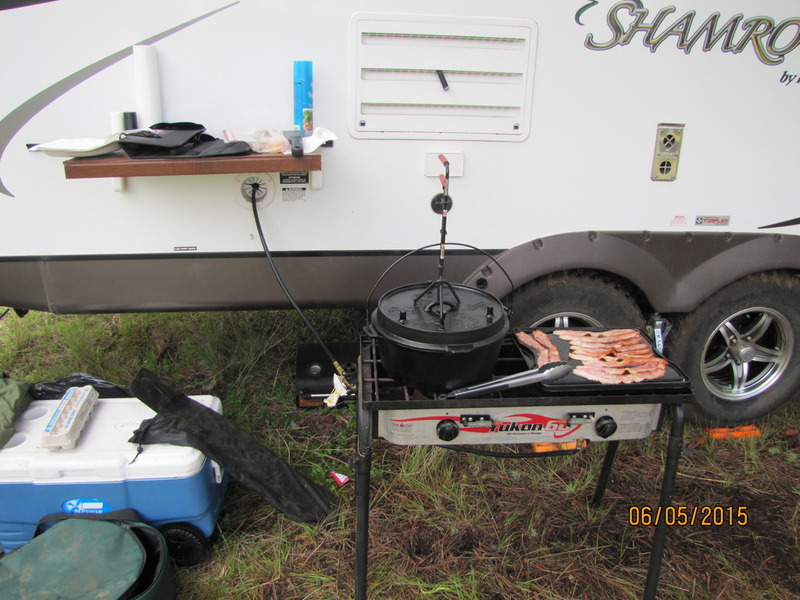 To assemble, mix eggs, hash browns, sausage & cheese, put into 10" Dutch Oven with 8 briquets under & 11 briquets on top (350 degrees) for 10-29-minutes. Serve & enjoy. If you use an deep aluminum cake pan it makes clean up a whiz.